The factory machine gun mag catch was an option that got left off the semi-auto because of the trigger group block that HK welded in to meet BATF approval. RDTS can precision install an authentic HK FLAP MAG RELEASE on any HK, including the clones. We install the flap mag release in the BATF approved manner. This simply means that after installation your receiver block remains intact and no through hole exists. If you ever had to change mags on your HK quickly you probably have noticed how you must remove your strong hand from the pistol grip position to press the mag catch button to release the magazine while repositioning the gun onto the left hand, Whew! what a pain! With the COMBAT FLAPPER MAG RELEASE, which is on ALL HK ORIGINAL Mg's, you simply grab the catch and magazine at the same time with your left hand while your right hand never leaves the ready position on the pistol grip! This is similar to the AK style mag release method. The affected area is the left side of your receiver block which is milled back to its original flat and appears as it did when your weapon was sent to RDTS. The block is what the lower trigger group rests on to the rear of the mag well. The rest of the weapon is unaffected and you cannot tell the operation had been performed. Note: After the machining and installation of the Combat Flapper Mag Release we will touch up with baked on HK Black. Confused yet? Well try to explain the different styles. Friction Flapper was normally found on G3’s and older HK’s. It is flap that has an angled contact surface that contacts a matching angled piece inside the mag well on the shaft that your mag button is pinned to. Sounds complicated but what it means is it’s a friction style. An angle forces another angle over to push the mag catch out of contact with the magazine thereby releasing it. Check out the picture. 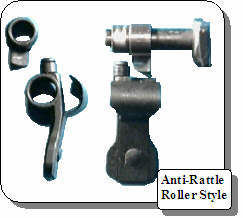 Roller Style is an improvement over the friction in that the flap contact area now has a roller or cylindrical piece that contacts the angled piece on the mag catch shaft. This reduces some of the drag associated with angle to angle contact. Keep in mind if you buff out the older style angle contacts you can’t perceive any difference. And the roller shaft is not as supported as the full beefier angle. Its your call, we have both! Anti-Rattle refers to a small leaf spring that is riveted to the flap itself. It is available with either friction or roller flaps. Its purpose is to keep the flap from rattling when a mag is in the weapon. 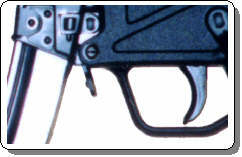 The leaf spring bears against the inserted mag causing the flap to be pushed back against the rear part of the mag well eliminating slack and therefore rattle. Without a mag in the weapon the flap still rattles. When RDTS installs a magazine Flapper release on your weapon it doesn’t rattle! We are not an assembly line so we can take the time to precision fit the contact areas. We also buff the angle contact areas and the bottom of the mag catch itself that bears against the slot it sets in. Through experience we have seen these procedures will give our customers a smooth and wear free assembly no matter what style they use.